READY FOR IMMEDIATE MOVE IN! NEW CONSTRUCTION by Payne Family Homes on a 1.034 AC lot with fantastic views in an upscale, gated community. This elegant plan has 3,863 s/f, a MAIN FLOOR MSTR SUITE, dynamic 2 story Grt Rm & 19x12 Sun Rm. 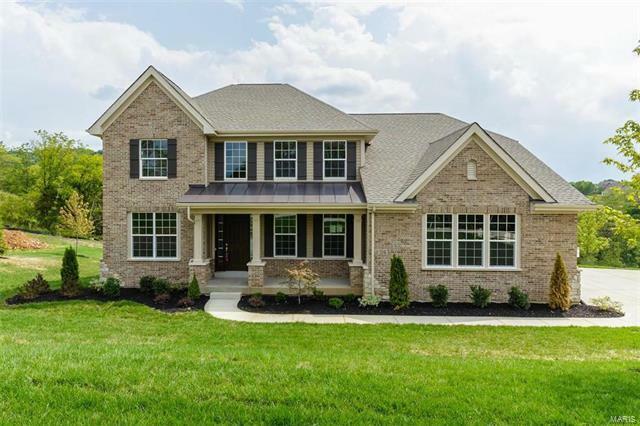 Features inc 4 BD, 3.5 BA, 9-18’ ceiling heights, gas FP w/stone surround, hand-scraped Hickory flrs, granite countertops, peninsula w/brkfst bar, st steel appl, dbl oven, roll out trays, gas cooktop, W/I pantry, U/C lighting, frml DR w/tray ceiling, crown molding, transom windows in the Sun Rm, a huge Master W/I closet, Lux Mstr Bath, W/I closets in every bdr, private bath in bdr 4, Loft, main flr Flex Rm, Hi effic dual zoned HVAC, 2 50-gal wtr htrs, W/O bsmt, R/I bath, Jeld-Wen low E windows & more. The streetscape is spectacular w/brick, stone detail, arch shingles, O/S 3 car side entry garage, full sod, irrig & prof landscaping. Pevely Farms is located in the sought after Rockwood school dist & has easy access to Hwys 44 and 109. MOVE IN READY! From 44 heading East, Exit at Lewis Road, turn Left onto North Outer Road, turn Right onto Lewis Rd, continue for .9 miles, turn Right onto Stonewall Drive to Left on Stewards Lane.